A unique celebration of the new year centuries removed from the commercialised western festivities. It attracts Tuaregs from all over Libya and from nearby Algeria and Niger. 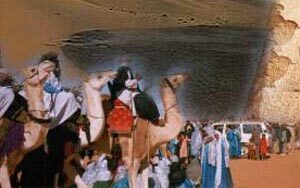 You can see a traditional camel racing, performances of Tuareg dancing, an exhibition about the live of the Tuareg in the Sahara, Tuareg handicrafts. Close to Ghat is the Jebal Acacus with one of the world's most extraordinary ancient rock art, older than 10000 years. The whole Acacus area is added to Unesco's World Heritage List of Endangered and Protected Sites .